Hello Monday! How was your week-end, guys? I enjoyed finally a pretty relaxing one at home, doing spring cleanings, cooking for hubby and getting serious at the gym. After Friday and Saturday at home, we got our day off on Sunday. We already arranged with some friends for having a lunch out but we haven’t yet booked anything – weather forecast was pretty bad, so we were not in a hurry to decide. Our problems started on Sunday, when all the places we short-listed ended up being complete or privatized. After brief consultation and as the weather was improving, we decided to check other places where we could eat in the sun. Bad luck, five out of five were already fully booked at 11 am. I started to be a bit nervous, so I took the Explorator guide and, excluded gastronomic places, I started to call all the places in the list opened on Sunday lunch. We restricted our selection to French, Luxembourgish and Italian and we excluded as well places in the North of the country, as hubby, as usual, was far away to be ready on time. Long story short, we found a place after other ten calls on the list. Again, my husband won as we were heading for an Italian, Boccon Di Vino in Esch sur Alzette. We heard a lot about this restaurant and we wanted to try since long time, but always failed to find a good occasion. After picking up our friends, in a day that was now sunny and hot, with open car windows, we got to Esch around 1 pm. The restaurant is located in a very central area of the town, but does not have private parking and the streets around were pretty crowed, so we took not much time to create an Italian parking just very next. The restaurant is located on two levels, but only the first one was used during the lunch service. Very bright view, even if on the street, and stylish rustic atmosphere. We were welcomed by the only waiter, who gave us the menu, pretty in a hurry, while we ordered an aperitif. We had very much time to check the menu as from that moment on the service took very long. We discovered there were also some daily suggestions together with the usual card as they were just lying on a board next to our table – but they were not very well presented. We opted for two mixed Italian starter for 2, with cold cuts, cheese, marinated vegetables, jams and honey to share between the two couples, followed by a main dish of pasta each. 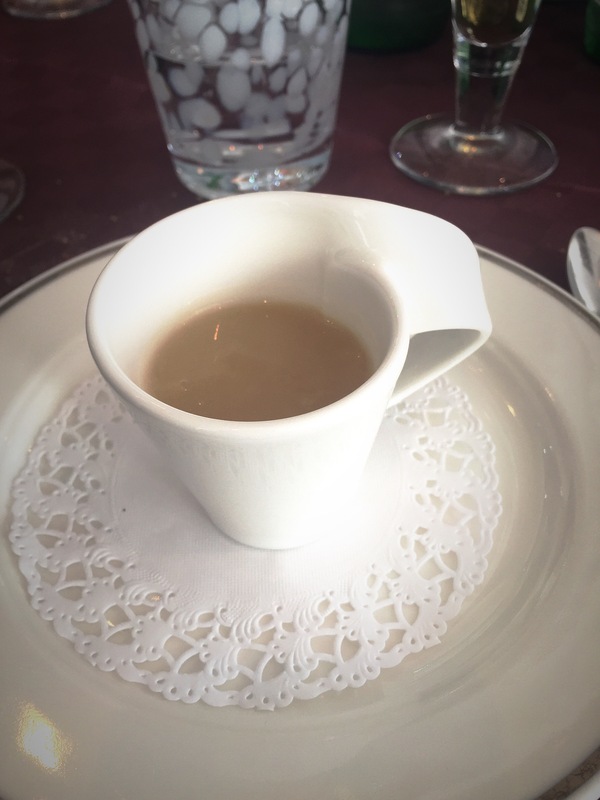 We asked for the list of wine that arrived together with a asparagus cappuccino with truffle, – tasty. We received the wine (Terre della Baronia 2013) after some times, again, very in a hurry. We were served it – we noted on the other guests glasses were the same whatever you were having red or white – and the bottle was put in its ice few steps from the table. We finally got the mixed starters (5/10). The price of the platter for 2 was 34 Euro, we ordered two, so the total amount of the serving was 68 euro. 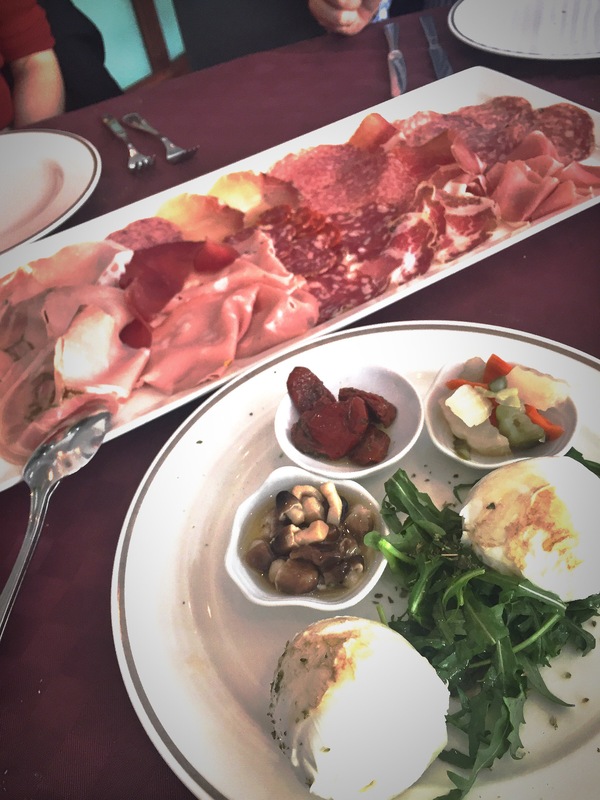 We got these big platter of cold cuts and a separate platter with two mozzarella and some pickled vegetables. Was the plat bad ? No, definitely. Was the plat deluding? Yes, indeed. First if the platter is for two and we ordered two portions, we were anticipating having at least 4 pieces of each cold cuts. How would you presume to share if one charcuterie you have 3 pieces, one 2 and one 1? Are we expected to cut each slice in a half? Fine for the mozzarella but not for the charcuterie. Second point: most of the cold cuts were salami and mortadella – the cheapest one. There was only one slice of breasaola and one of prosciutto, plus two slice of coppa. Considering the price of the platter, there could have been more balance (less choice, but one piece each, with wider range).. Lastly: if you present it as “mixed starter with cheese, cold cuts, jams and vegetables”, you cannot bring a big platter of salami and two mozzarella. Where are the cheese with the jams? Where are the marinated vegetables? Are you calling vegetables few pickled on side? Once we finished the starter, we got to wait more than 20 minutes to see the main. We had to stand to take the wine ourselves, as the waiter was nowhere to be seen – so why not leaving the bottle just next to the table? Wouldn’t been easier? The main were on two different levels: I had a Filei with nduja” (10/10), fresh past with hot salami from South of Italy. 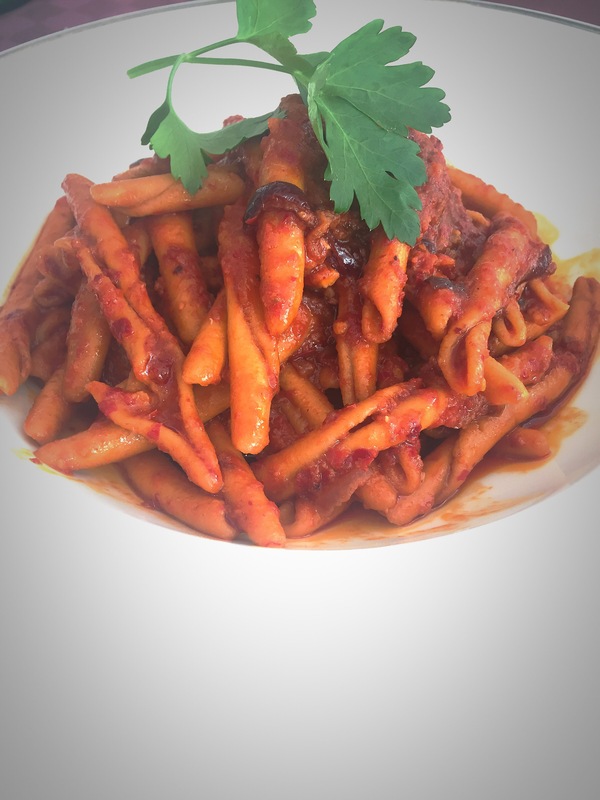 The portion was very big and the pasta was amazing: savoury, spicy, tasting, definitely one of the best pasta dishes I had in my life. My friends had “amatriciana” – with tomato sauce, cheek lard and pecorino cheese – and his wife fresh ravioli with mascarpone cheese, provola cheese and speck. Both of them were very happy, only the portion of ravioli was indeed very small compared to ours. Hubby indeed chose Spaghetti alla Carbonara (2/10) and was really deluded, so much I gave him half of my dish, to avoid leaving him empty stomach. 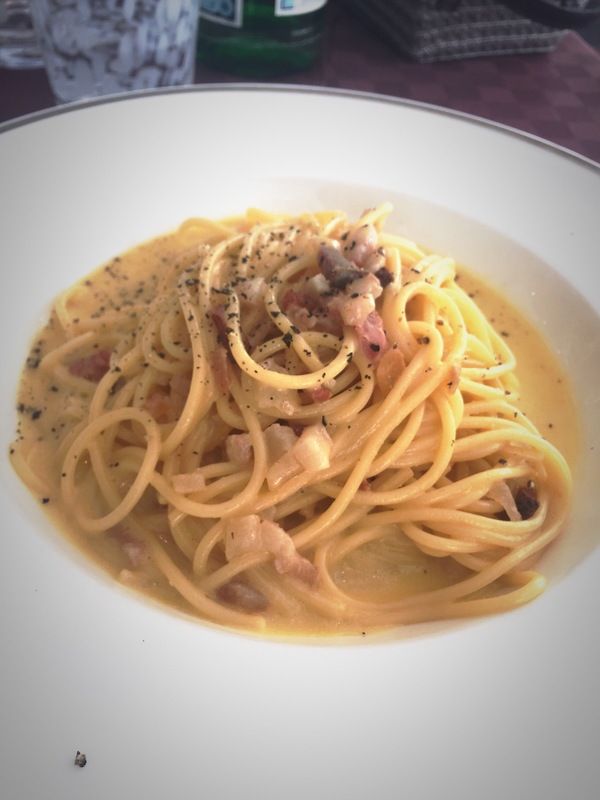 I tasted the carbonara and indeed was terrible. You could taste only the eggs, too much eggs. Some spare pieces of cheek lard were there, but giving no taste at all. Even if I was still hungry, I couldn’t really finish it. We concluded with coffee (extremely good) and we asked for the bill, that came as 95 Euro per couple (47,5 Euro each). Find the pictures of our lunch followed by my impressions about Boccon Di Vino. The combination between menu and daily suggestion makes the choice pretty wide. On the menu, you have mainly classical dishes but the daily suggestions have special ingredients and blend. The location is spacious and cosy, perfect for a relaxed meal without much formalities. My pasta dish was really delicious. Service was indecently slow and superficial. Clearly because the waiter was left alone to take care of the all restaurant, but we would have preferred a different attitude. Mixed starter platter was, also in consideration of the price, very deluding, as well as my husband’s dish. For being in Esch sur Alzette and for what we had, I had the feeling we overpaid a bit. In conclusion, we had a lovely Sunday out with friends, and that was the most important thing. Concerning the restaurant, probably the negative sides were so many and so different, that buried the positive sides of our lunch (my delicious pasta for example). While the place is pretty good for informal lunch with friends and family gatherings, I don’t feel at the moment I would recommend it. *** Do you want to try Boccon Di Vino or another restaurant in Esch/Alzette and you don’t have a car or you fail to find a sober driver? I used to think this was a huge issue and I was limiting my restaurant reviews to Luxembourg city until I have discovered a fabulous service – the one Drink and Drive Luxembourg is offering. I suppose I am not the only one who happened to say “Yes, no worries – I will be driving and I will not drink” and then get involved in the celebrations and realize I am no more able to be the one behind the wheel. What to do in this case? Call a cab (already not cheap) and leave your car behind? The best solution is to call Drink and Drive. You don’t need an advance reservation, they will come, pick your car and drive you home with that. Result? You arrive at home safe and your car will be already with you the morning after – if you are not too hangover to drive again. The cost? No more than a black cab service, plus, the more away from the city you go, the cheapest it is compared to a taxi service. Check their website for more information and plan ahead your dinner date out of town with the sunny days.